Author’s note: This is not a review, but rather some reflections I had after finishing the series. There are light spoilers ahead. When thinking of the word “freedom”, I’m reminded of the day I defended my thesis. For the first time in my life, I felt true nervousness – never before have I felt the numbness in my hands, the shortness of my breaths, and the panic freezing my thoughts. I wasn’t prepared enough. My adviser was clearly upset that he still had much to correct in my presentation. I was ready to cry and break down, just one hour before the defense starts. Sensing that I was on the edge, my adviser told me to sit down. I don’t remember things clearly anymore, but I remember him patting my back. I remember him saying that he treats us advisees as if we were his own kids, and that he was upset for our sake, that he wants us to give a presentation that we can be proud of. Hi [deepbluejeer]. Congratulations again. You should be very proud of yourself. Good luck with your manuscript. I’m pretty sure I teared up when I read that message. I’ll never forget the relief and accomplishment I felt at that moment. Looking back, I think that was when I first tasted true freedom – the wonderful feeling of a heavy burden getting lifted from my shoulders. Freedom comes in many different forms; each of us has a unique burden to carry. 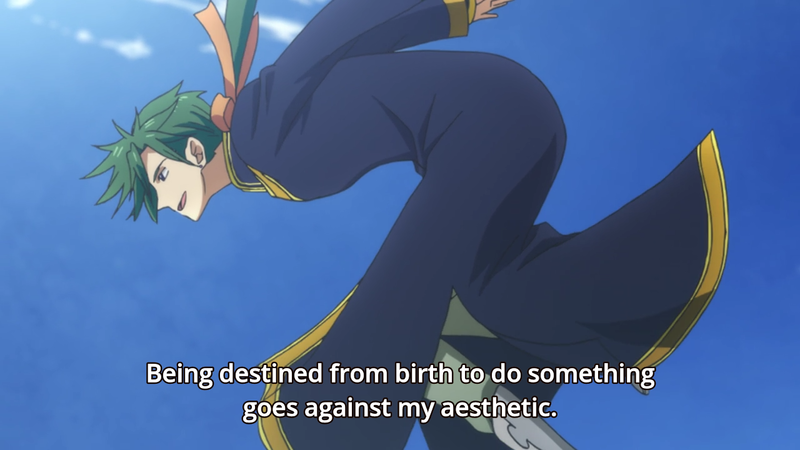 Take, for example, the protagonist of Akatsuki no Yona. 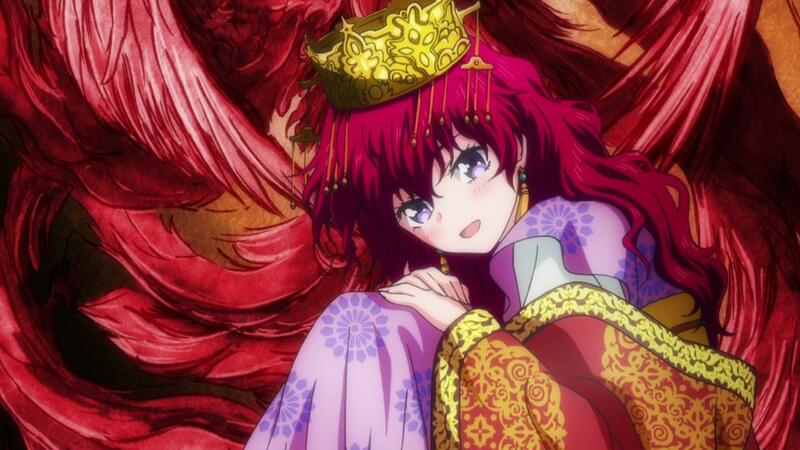 For all of her life, Yona has been sheltered – living life in the comforts of her castle, protected by her over-protective father. But what happens when a caged animal is suddenly freed? To an animal used to living in a cage all their life, freedom is a burden – without someone to guide them, they’ll surely die in the outside world. In the same way, Yona is thrown out of her castle along with her bodyguard Hak, and together they narrowly escape death from their pursuers. For the first time, Yona is free. But having lived in ignorance all her life, what is she supposed to do? Though she’s no longer bound by anything, she also doesn’t have a sense of purpose. Just as a newborn animal needs a parent to guide its instincts, Yona needs someone to show her a path. And that path is to gather the four dragons under her command. It’s through these dragons that we see the different forms of freedom. To the first dragon, Gija, he wishes nothing but to fulfill his purpose – to serve under his king, the red dragon. 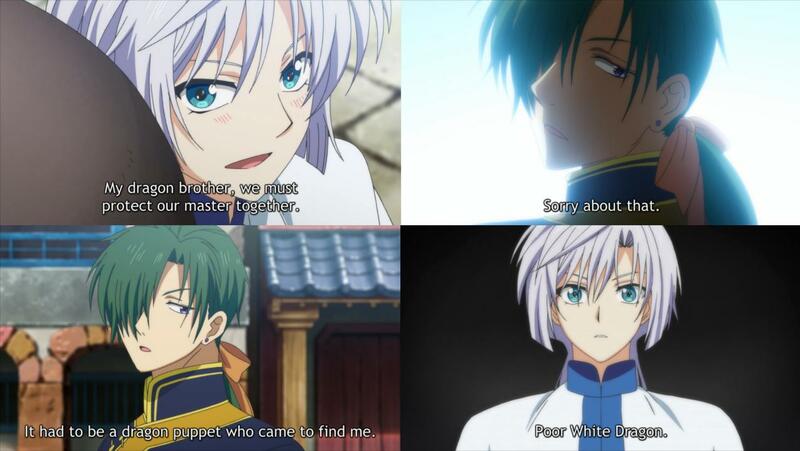 Yona is welcomed to the white dragon’s village, and Gija joins Yona of his own volition. This is freedom, in a sense – he is free to leave the village and pursue his purpose. Or is it? In direct contrast to the white dragon’s case, the blue dragon’s environment is not friendly. While Gija’s tribe welcomes the white dragon’s power as a blessing, to the blue dragon’s tribe it is a curse – it’s a power to be feared. To the blue dragon’s family, they are shackles. Yona’s role, then, is to be the one who breaks the shackles. Freedom is scary – especially to someone so used to living in the dark all their life – but not if you have someone to light your way. Yet another approach to freedom is introduced in the form of Jaeha, the green dragon. Jaeha is the very definition of a free spirit – not content to be bound to a master, he continues to rebel against the dragon’s blood that tells him to serve Yona, even going as far as clashing with Gija about their “destiny”. 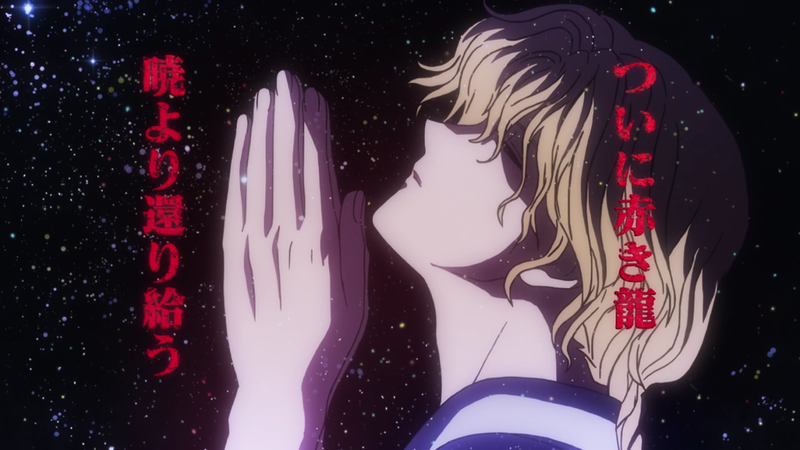 Jaeha’s arc, in my opinion, is the highlight of Akatsuki no Yona: it’s a fitting climax where Yona has to prove her worth – that she has something she can do that the dragons and Hak cannot. And at the end, she earns Jaeha’s respect and gets him to choose to be with her. 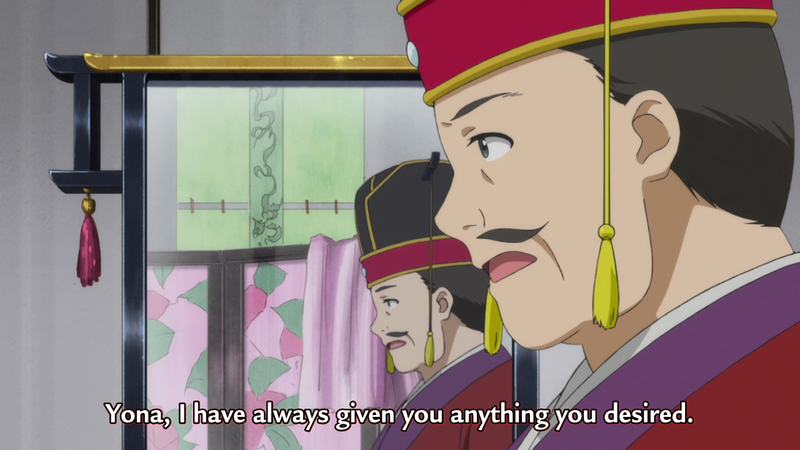 But perhaps the biggest seeker of freedom is Su-Won, the traitor and childhood friend of Hak and Yona. Su-Won is ambitious – to him, the peaceful era of King Il was not true freedom. King Il was a pacifist – to avoid war, he conceded many things to neighboring countries, leaving his own kingdom weakened and his citizens poor. 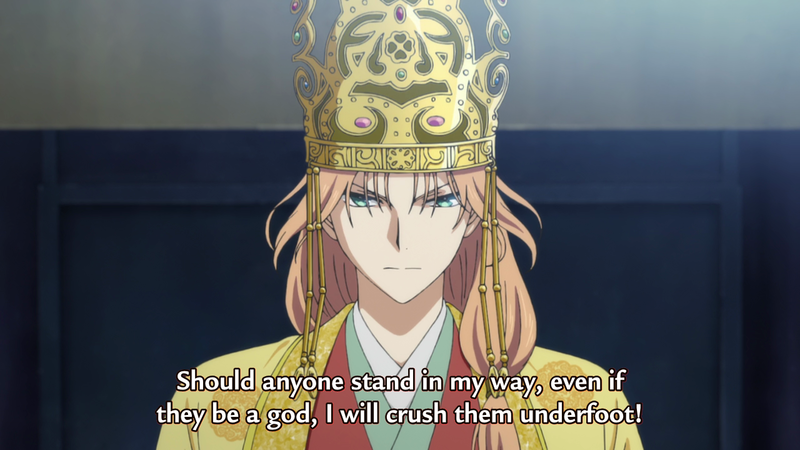 Assassinating King Il was the first step to overcoming that legacy – throughout the show, we see Su-Won preparing his new kingdom to overturn King Il’s pacifist policies. At the center of all these characters stands Yona. At the end of the show, the yellow dragon poses an important question: what will she do with her allies? Will she take them and wage war against Su-Won to retake her kingdom? Having grown from her travels and her new bonds, she no longer needs her path to be shown. She is no longer the dainty, sheltered princess we see at the start: throughout her journey, she has proved that she can – indeed – stand equal to the powerful allies she has gathered. 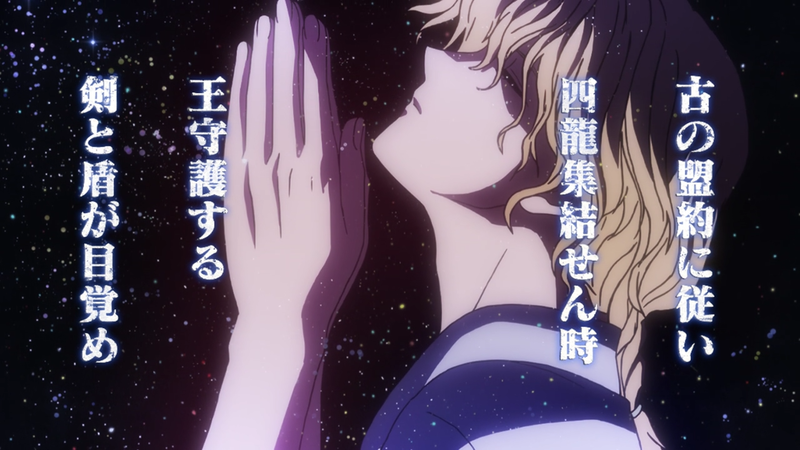 Akatsuki no Yona ends on a vague note. While the show is brimming with things that are waiting to be discussed, it also ends much too quickly to see all of its themes through to the end. Yona’s growth as a character is only beginning, and the clashes between the ideas of freedom between each character are left unresolved. The show ends before things even begin, and all we’re left is a short journey and an intense desire for a second season. Enjoyable fantasy adventure with very appealing lead heroine. Neither a Mary Sue nor a damsel content to rely on the powerful and handsome men all around her, Yona strives to improve herself with the best of them. 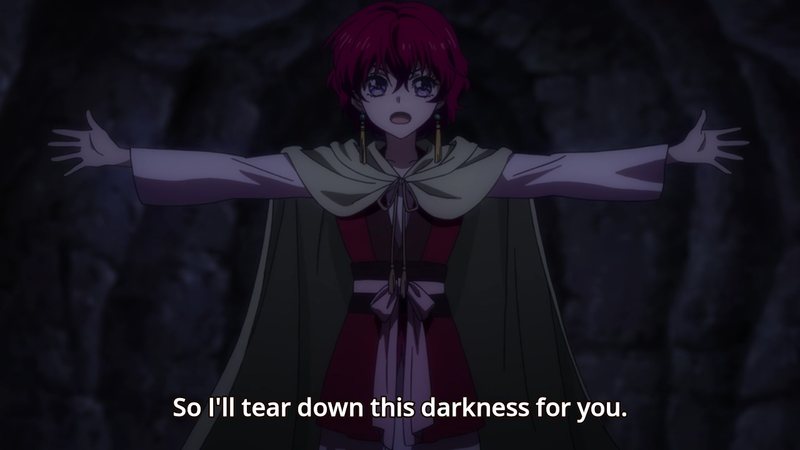 And I agree: Yona may be weak, but she is not helpless – her drive to improve herself and not lose to the strong people around her has, time and time again, attracted me to her character. As far as shoujo manga-style heroines go, Yona is definitely near the top. 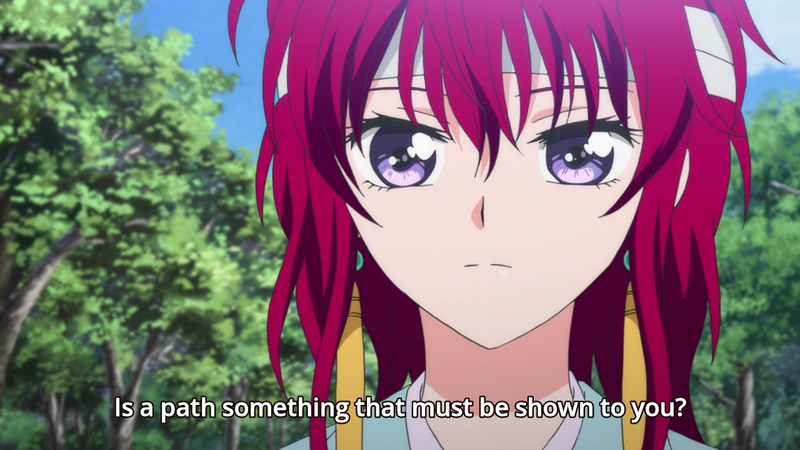 This entry was posted in Anime, Uncategorized, Writeups and tagged akatsuki no yona, anime, essay, secret santa by deepbluejeer. Bookmark the permalink.